Here, Professor Martin Samy presents a collection of his academic papers on Corporate Social Responsibility and Effectiveness Measurement, drawing on 15 years of research and covering areas including Indonesia, the United Kingdom, Australia, Bangladesh and Nigeria. The increasing demand of stakeholders’ interests in social performance is giving impetus for companies to undertake social responsibility reporting in their operations to fulfil the demands and to gain public support. Many organisations, especially in developed economies, have already responded either by publishing a separate report regarding their social activities or by providing such information in their annual report or website. However, in some developing countries, there is limited or very ‘weak’ CSR legislation and governmental policies. Having no expectations to follow international CSR guidelines, corporations in these countries tend not to provide CSR reports. Examining the relationship between CSR and Financial Performance of corporations in developed economies, Martin and his team studied 20 selected UK public corporations. They aimed to prove that, by strategically investing in CSR, profits can be increased and the demands of stakeholders met. The research team analysed the companies using the Global Reporting Initiative (GRI), the trends of earnings per share (EPS) and the Price Earnings ratio (PE), and found that only four of the 20 companies met all six guidelines of the GRI. A very weak but positive relationship was found when analysing the EPS and PE data. In another similar study of Indonesian corporations, Martin’s findings revealed that, despite the lack of CSR initiatives by government authorities, Indonesian firms are already aware of the increasing demands and provide CSR information to stakeholders. In comparison to other research undertaken, this study showed that CSR reporting by some large and well-known Indonesian companies is comparable to UK and Australian companies. Martin’s lecture considers how, in the past, most CSR researchers have relied on stakeholder theory as the basis for explaining corporate social and environmental disclosures. However, he explains how recent evidence from other studies shows that legitimacy theory is gaining popularity amongst scholars in their quest to explain the motivations behind corporate social and environmental disclosures. Martin also argues that, particularly in developing economies, governments should play a key role in CSR practices and reporting. 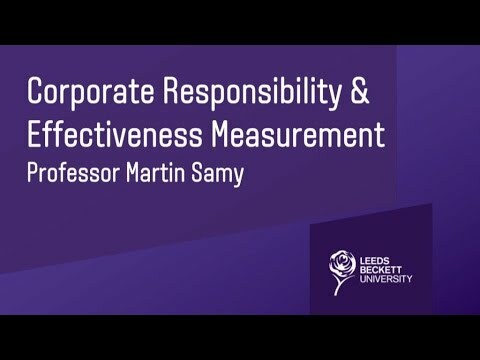 Martin Samy was a Professor of Corporate Social Responsibility and Effectiveness Measurement in the School of Accounting, Finance & Economics at Leeds Beckett University. Martin’s professional career began in Singapore and Australia, where he worked as a Financial Manager. Prior to joining Leeds Beckett University in November 2008 as a Senior Lecturer, Martin was an Associate Member of the Certified Public Accountants in Australia and a member of the Australian College of Educators. In 2007, Martin was recognised in the prestigious Marquis ‘Who’s Who in the World’ publication for his research in establishing a Quality Effectiveness Instrument (QEI). Martin’s research interests are in the areas of Corporate Social Responsibility (CSR) and Financial Performance. He has undertaken research studies locally, regionally and globally (in Australia, the UK, Indonesia, Bangladesh and Nigeria). His research into UK school improvement and effectiveness, which saw him study a number of schools in Leeds, has led to an established consultancy service, and Martin’s QEI methodology has also been developed into a tool called the Money Management Barometer by TD Direct Investing. In the area of CSR, Martin and his co-authors have published a number of journal papers investigating the relationship between CSR and the financial performance of corporations in developed economies. Martin and his team believe that investing strategically in CSR both maximises profits for businesses and satisfies the demands of stakeholders.